By now, I'm sure you'll all be aware of my penchant for capes. Having recently forayed into the world of the trench coat, I knew when I spied this kind of weird but simultaneously beautiful trench-cape hybrid, I had to have it. When styling it, I wanted to keep most of the focus on the cape itself; being such a unique piece. So, I dressed it up with a pair of leather trousers (or what my friend Bianca refers to as 'Topshop's finest pleather') and a white polo neck with button cuff details. 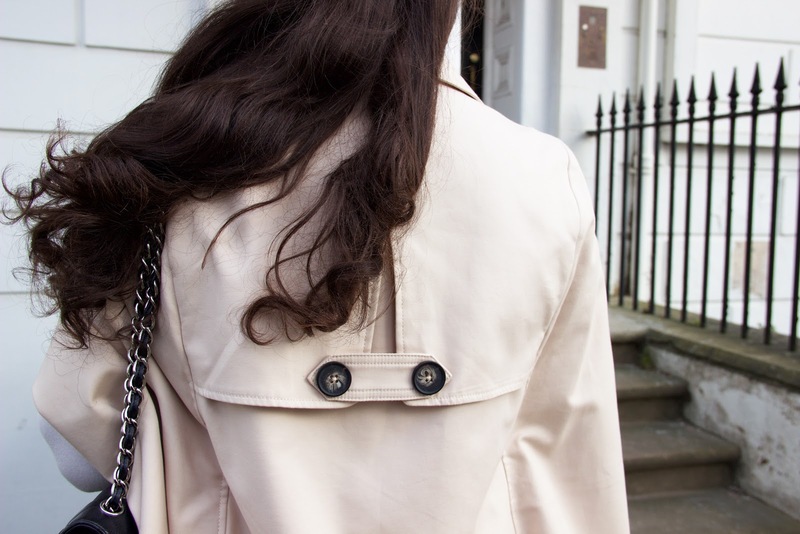 Spring is obviously the time when lighter colours and fabrics begin make their way into our wardrobes, and trench material is a spring classic. Light, but also durable enough to withstand the April showers and keep the chilly breeze at bay. Or... this would be true, if the 'spring' we're having this year wasn't so dreadfully cold! FYI: the cape has now been reduced from £75 to £35 - click here to take a peek. I love your outfit, especially the cape. Hello Arabella ! Just want to say that I love your style so much !! It is perfect and so chic !! Really elegant ! Trying to find some of your items but it is not an easy thing in France !